The sun umbrella “Leaf for life” is a shade sail in acrylic fabric reinforced UV and water repellent. 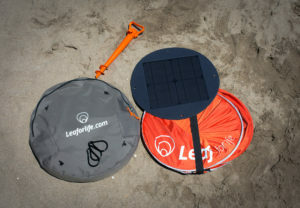 It fits in a round backpack, which allows you to hang a removable solar panel on the outside, to recharge your devices while travelling. 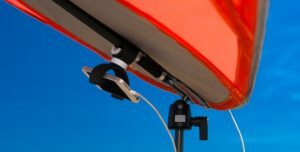 It has a folding telescopic foot “scratched” to the bag, the foot is completed by a multi-directional 360 ° tilthead for the sail which is retractable. The monocrystalline solar panel, 16 Watts, is “equipped” with two USB ports. The aerodynamic shape of the shade sail, and its principle of free sailing (sail without any lost angle) allows the free circulation of air, avoiding the accident of the parasol “which flies in the air”, as do the traditional sun umbrellas. The solar panel can be added either on the sail or on its carrying bag. As a result, it takes just one hour of sunshine to charge your tablet, smartphone or Ipad. Xavier Aubry and Cyrille Jourdain, the French co-inventors of “Leaf” sun umbrella and co-founders of the French start-up “Leaf for life” founded in Perpignan,South of France, patented their invention worldwide. 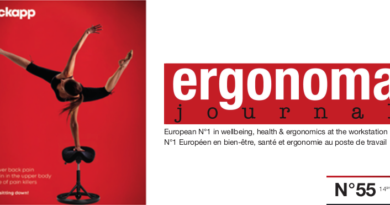 The young company develops accessories to multiply the uses of the Leaf for Life. Available to date: a USB fan. Leaf for Life has developed an online sales strategy with an online store.